Squidward is all set to find inner peace with a famous spiritual yoga master—until he’s joined by guru-curious SpongeBob and Patrick! An inner journey turns into an ordeal of psychic stupidity. See an infinity of SpongeBobs! Witness the nothingness within Patrick! Can Squidward possibly find oneness while surrounded by dumbness? You’ll see in “You’re Not My Swami!” Then in “Pennies for Patties,” Mr. Krabs’ quest for a super-rare penny turns the Krusty Krab into a giant bin of copper coinage! But what if one of his employees finds the rare penny first? 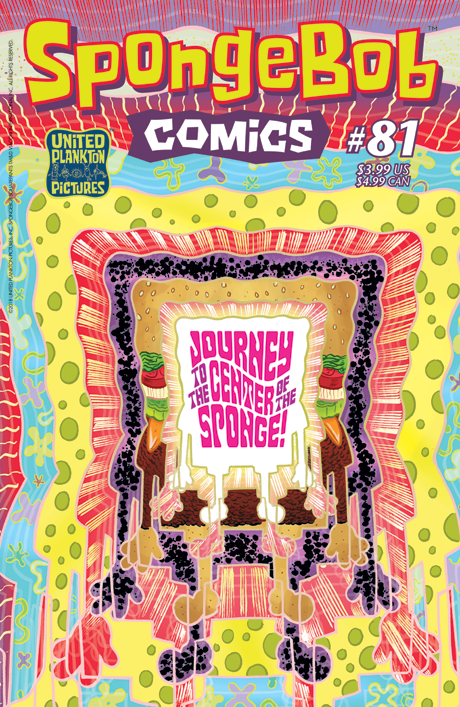 All this plus “SpongeFunnies” by James Kochalka and ocean facts from Maris Wicks!